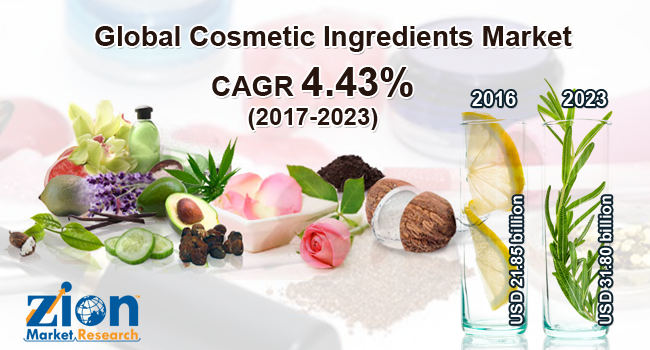 With the presence of a large pool of participants, the Global cosmetic ingredients market is displaying a highly competitive business landscape, finds a new research report by Zion Market Research (ZMR). Akzo Nobel N.V., Ashland Inc., BASF SE, Croda International Plc, Clariant AG, Evonik Industries AG, Solvay SA, and The Dow Chemical Company are some of the key vendors of cosmetic ingredients across the world. These players are focusing aggressively on innovation, as well as on including advanced technologies in their existing products. Over the coming years, they are also expected to take up partnerships and mergers and acquisitions as their key strategy for business development, states the cosmetic ingredients market study. Citing an instance, on August 17th 2018, the CEO of ExcelVite Sdn. Bhd, a key Malaysian supplier of palm-derived vitamin E, stated that current research supports the beneficial effects of vitamin E supplements on skin health as well as hair growth. As estimated in this report, the global cosmetic ingredients market stood at US$ 21.85 billion in 2016. Witnessing a tremendous rise during the period from 2017 to 2023, the revenue in this cosmetic ingredients market is expected to reach US$ 31.80 billion by the end of the forecast period. The main product types available in this cosmetic ingredients market are surfactants, conditioning polymers, emulsifiers, emollients, antimicrobials, UV absorbers, antioxidants and preservatives, and Rheology modifiers. Among them, the demand for surfactants is relatively higher and the trend is anticipated to remain so over the next few years, notes the cosmetic ingredients market research report. “Cosmetic Ingredients market is anticipated to garner commendable gains over the coming years with myriad product applications in hair care, skin care, make-up, and oral care,” says the author of this study. Apart from this, rise in the buying capacity of global population is projected to drive cosmetic ingredients market trends over the years to come. In addition, escalating demand for cosmetic ingredients in developing regions is projected to accelerate the cosmetic ingredients market scope. Enforcement of strict legislations, however, is predicted to hinder the progression of cosmetic ingredients market in the near future. Nevertheless, the changing consumer trends and lifestyles are projected to elevate the business space, in the years ahead. This, in turn, will normalize the impact of hindrances on the cosmetic ingredients market, reports the study. Regionally, Asia Pacific has been leading the worldwide cosmetic ingredients market and is anticipated to continue on the dominant position in the years to come, states the market study. Rise in the disposable income, escalating demand for cosmetic products, and rapidly expanding population is the main factor behind the dominance of the Asia Pacific cosmetic ingredients market. Rapid urbanization witnessed in countries such as India and China along with rise in the purchasing power of the consumers in these regions of Asia Pacific is another significant factor that is supporting the growth of the regional cosmetic ingredients market.